A Quiet Corner: How Does Sunshine Make YOU Feel? How Does Sunshine Make YOU Feel? 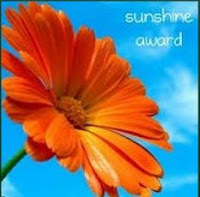 Recently this Sunshine Award was given to Tracy creator of My Thoughful Spot. Feeling that we all deserved it, she passed it on to her fellow bloggers. · Answer 10 questions about yourself. · Nominate 10-12 other fabulous bloggers. · Link your nominees to the post and comment on their blogs, letting them know that they have been nominated. · Share the love and link the person who nominated you. What are your favorite things to do? I enjoy meeting people, gardening, the outdoors, family and my dogs! Where would you most like to travel? I would love to visit National Parks here in the States. What do you think is the hardest thing to do? See my loved ones in pain. What is your favorite charity? Organizations against child/spousal abuse. What are you proud of? I proud of being ME! What ambition do you still have? I want to enjoy and savor as much of life as is given to me. Since the PAY IT FORWARD approach to life is one of my strongest convictions, feel free to grab the button! I love getting to know people! Congratulations on the award. Look at you spreading sunshine. i love Grisham and Patterson to. about half your things are mine to. we share charity and drink and travel. Congrats JP! Joan of Arc - cool pick! Have you read the book on her by Mark Twain - great read! CONGRATS on the award! I love them because we get to learn something about you that we may not otherwise and find that we have a few more things in common!